As you probably guessed it, I'm not a huge fan of recliner chairs. I'm more of a cozy chair and ottoman kind of gal. Though after several requests from clients (mostly male clients! ), I decided to source a few options that I could gladly recommend for my residential projects. Here are the 6 surprisingly stylish recliners that made the cut! 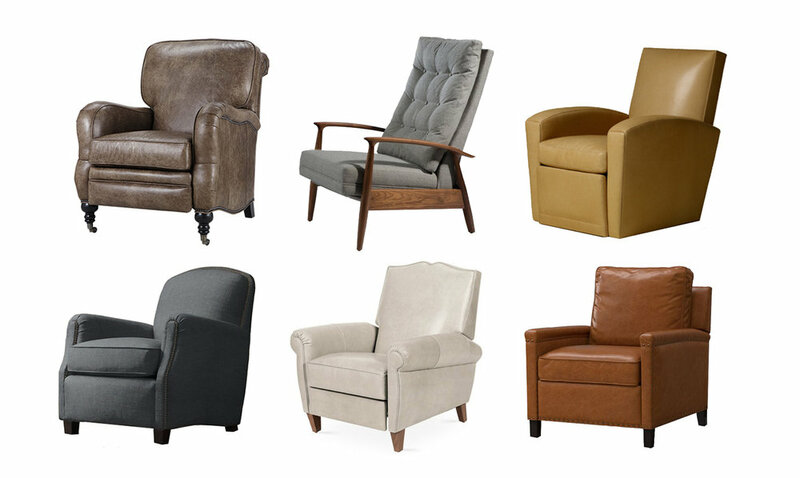 At the top of my list is the Brooklyn Recliner - a take on the classic English roll arm club chair. I love the beautifully curved silhouette and nail head detailing along the sides. For those that can't get enough Midcentury modern, the Viceroy High Back Recliner Chair is a fabulous alternative to Milo Baughman's Recliner 74 sold at DWR. Sophisticated yet practical, the Viceroy has a concealed leg rest and high back supportive cushion. The Emile Reclining Lounge Chair is oh so California-chic, and would fool most of even being a recliner. It's sleek, contemporary design could be used in a modern living room or glamorous den. For city dwellers, there's the Keaton Upholstered Club Recliner. It's petite scale (only 31" wide x 38" deep) makes it a great option for small city apartments. Also, it can be made to order in RH's over 100 fabric options, including the Perennials performance fabrics! The Hartford Club Recliner, in this gorgeous oyster-toned leather, is my personal favorite and what I would get for myself. I adore the scalloped detail on the square back and tailored self-welt seams. This would be a great reading chair in a neutral bedroom or chic library. Last but not least, there's the Tyler Leather Recliner by Pottery Barn. This classic and versatile option, which I personally like in the Maple or Midnight leather, has clean lines and an industrial feel. Which is your favorite? Have any others I should include on my list? Excited to hear what you think!